One of the bigger challenges of “There’s Something About Mary” was the suspension of disbelief required throughout. The episode opens with a Hellhound chasing down “banshee girl” Eileen Leahy (Shoshannah Stern), at the command of British Men of Letters baddie Arthur Ketch (David Haydn-Jones). The idea that one of these demonic creatures, which tore apart Dean at the end of Season 3, can be controlled by a human with a supernatural dog whistle and kept locked up in a metal dog cage is disappointing, to say the least. It’s also hard to believe that zealots like the British Men of Letters would make a deal with the King of Hell. There’s no way these haughty bastards are going to think that demons have intel that’s worth letting them keep taking souls, even from idiots. Equally unbelievable is that, although we’ve never seen any interaction between the King of Hell and the British Men of Letters, we’re supposed to believe that Crowley (Mark Sheppard) is willing to lend out one of his Hellhounds. The idea that enemies Crowley and Castiel were working together in Season 6 was at least believable because we understood their motivation and overlapping goals. Without that, the deal between Crowley and the Brits just feels like a contrived plot device. Speaking of contrived plot devices, in the short time that Mary Winchester (Samantha Smith) has been held captive she’s become completely brainwashed. At first, we assume she’s a shapeshifter, but then it becomes clear that it’s actually Mary who has been off killing her old hunting buddies. And, uh, where does Mary get these old hunting buddies anyways, since she’s been off the grid for 30 years? Lady Antonia Bevell (Elizabeth Blackmore) tells Mary, “You’re being realigned. Soon you won’t be able to differentiate between your thinking and ours.” Toni is so successful in her brainwashing techniques that Mary can’t regain control even when it comes to her sons. So. Many. Questions. If Toni could do this in such a short time, why didn’t she try to brainwash Sam? For that matter, why bother to kill all these American hunters if you can brainwash them so easily? The Brits seem very organized, but we’re often left wondering about the logic of their plans. If Toni is so good at brainwashing why does she wield no control over Mary herself? At the bunker, Ketch seems completely in control of Mary, though Toni is right there as well. Is Ketch using his Hellhound whistle on Mary? Why even use brainwashing as a plot device? And not even a noteworthy form of brainwashing. Had we watched Mary slowly get programmed to respond to a trigger throughout the second half of the season, à la The Manchurian Candidate or Firefly, well, that might have been interesting. But this is just a poor man’s version of possession. The last part of the story we feel compelled to pick apart is Ketch leaving Sam, Dean, and Toni to die in a Bond villain manner. He leaves them locked in the bunker where they will run out of oxygen and die in, like, two or three days. Really? Where is Scott Evil when you need him? And Sam and Dean look genuinely scared once the doors shut. Being trapped in the bunker isn’t even a danger worthy of Season 1 Winchesters, let alone Season 12 Winchesters who have killed countless monsters, gone to Hell, traversed Purgatory, died several times, and defeated the Devil. Then there’s the stuff we just don’t care about. We don’t care about the rivalry between Mr. Ketch and Lady Bevell or their sexual history. We know we’re supposed to hate Lady Toni, but we actually just hate watching her on screen. Dagon was a great villain, but Lady Toni is just plain unlikable. We’re really missing Mick and his three dimensions. There are some who have tired of the power struggle between Cro wley (Mark Sheppard) and Lucifer (Mark Pellegrino), but we count ourselves among those who still enjoy seeing these two together on screen. It would be hard to top the gasp-worthy reveal that Crowley was in control of Lucifer’s vessel, but Lucifer is nothing if not dramatic. Lucifer takes control, in a very comical scene, and then gets his revenge. The devil opens his wings and levitates Crowley before giving the King a final wink and stabbing him. The writers didn’t seem overly concerned if the audience actually believed Crowley was no more, sending the rat we presume now holds Crowley scurrying after his empty vessel. It worked well to bring viewers in on the scheme without resorting to exposition. It appeared to be a rat because of its size, but we initially hoped it was the hamster formerly known as the witch Olivette coming to Crowley’s rescue. Wonder what she’s up to. Good writing with engaging characters doesn’t need to shock viewers with death, though on the other hand, the bulletproof nature of some of the cast leaves us increasingly skeptical when it comes to certain plot developments. Finding a way to free both Lucifer and Crowley from the conflict between them opens the door to new possibilities and leaves us intrigued about what will come next for both the Devil and the rat. There were a couple of major plot turns in “There’s Something About Mary.” Not only did Lucifer gain the upper hand with Crowley, but the Winchesters finally realized the British Men of Letters were the villains of the season. Using the hidden microphone in such an obvious way to trick the British Men of Letters worked, but wasn’t part icularly remarkable in terms of narrative. 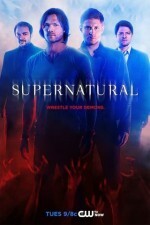 Sam (Jared Padalecki) and Dean (Jensen Ackles) are at their best when they give the audience something unexpected, like surprising viewers at the end of Season 8 by pretending to agree to Crowley’s terms, only to use a staged argument between the brothers to capture him. We like it when the boys are one step ahead of their foes, rather than taking a whole season to realize what’s really going on. The best Winchester moment in “There’s Something About Mary” was the gunfight in the bunker. Just one look between Sam and Dean and they know what to do. Now those are the Winchesters we love to watch. Despite the questionable brainwashing trope, Samantha Smith plays out Mary’s moments of despair and eventual zombification quite well. Eileen being chased down by the Hellhound in the cold open of “There’s Something About Mary,” didn’t give the character the due she deserved. Despite Jared Padalecki’s skill at showing Sam’s restrained grief, Eileen’s death didn’t have the impact we anticipated because it took place outside of the main story. We’re not mourning Crowley in the way we would have expected, either, after he was stabbed by Lucifer, but for entirely different reasons. Though the Winchesters being trapped in the bunker was pretty silly, seeing Lucifer standing on top of the world watching the sunset left us on a high note. Next week is the two-part Season 12 finale of Supernatural. Let’s see who survives.